Football: I’m back by (not so) popular demand …. NOTE: Monrovia’s Nick Bueno and St. Francis’ Travis Talianko among those named to Aram Tolegian’s Preseason all-encompassing SGV(N) All-Area Team at “In the Huddle”. What have I been up to, a lot of you have wondered over the last month or so. As our area coaches and players can tell you, they had to make the drive to our office in Pasadena to have their photos taken as we began preparing to put together the inaugural Prep Extra magazine, which is slated to run the first week of September. We’ve taken a much bolder approach this year with the magazine, and I’m happy to say our content for the magazine is done. Every story has been written, every ranking is in, cover shot finished, and now it’s in the hands of our production crew, the same people who do our popular Rose Magazine. Keith Lair and myself wrote team previews for every single team in the West San Gabriel Valley. No longer will you be subjected to reading league previews and team-by-team box previews like in the past. But we’ll have much more than just team previews, we’ll also have a preseason All-Area team to go along with Top 5 lists. Photos will blanket the pages, which are scheduled to run in full color. I’m confident the magazine won’t just be your best source for high school football, but also a great keepsake. There are exciting things happening in the West. St. Francis is arguably stronger, and it’ll need to be as it gets ready to compete in the morphed Mission League. All eyes will be on three studs on the rise: TE Travis Talianko, OL Patrick Carroll and QB Brett Nelson. Arcadia will be much improved with all nine sophomores who started last year a year older, wiser and stronger. You don’t need me to tell you how exciting players like Taylor Lagace make it fun for us to cover. Muir‘s all the talk right now, and again it’s the offensive line that figures to be the centerpiece, led by standouts Danny Huerta and Cameron Palmer. I’m hearing a lot of good things about Pasadena Poly, too. The Panthers have a solid attack that will allow them to scare some teams with an aerial attack led by 6-foot-5 quarterback Hunter Merryman and wide receiver-pseudo running back Blake Edwards. I’m a little worried about Temple City and Alhambra. Both teams are in search for some offensive power after losing plenty because of graduation and/or transfers. You don’t need me to tell you about arguably the most exciting team in the West, and that would be none other than Monrovia. What does it say about the Wildcats and the direction coach Ryan Maddox is taking the team when their preseason schedule includes only one area team? Monrovia will be tested right off the bat with Chad Jeffries and the Glendora Tartans. I figure Nick Bueno again will put on a show and add to the highlight reel. Monrovia, however, won’t be the only team with a tough schedule. You can add St. Francis and San Gabriel with tough preseason opponents. The Matadors invited Muir, Burbank and Rosemead to the party. Let’s hope injuries don’t become an issue like they were in 2009 (and, no, I did not just jinx them). You want some rising stars in the making? How about La Salle QB Mike Novell, Arcadia QB Myles Carr and Pasadena QB Brandon Cox for starters? Speaking of the Bulldogs … I’m hearing they’re going to play with more cohesiveness this year, but that remains to be seen. Over the last two months we’ve also transcribed hours of quotes, some of which made the magazine and many of which will make it here on the blog. I’ll touch on different topics over the next few weeks as I prepare to get the blog back off the ground. When you see the magazine you’ll understand all my time and effort was focused on the magazine. I welcome your input on what you want to hear from over the next few weeks. I don’t leave for vacation (probably New York or Vegas) until the last week of August, so I’m all yours until then. In the meantime, I’ll post some subjects and you give you some threads where you can start your banter as we prepare for Kickoff 2010. I know this isn’t high school-sports related, but I wanted to share this with you all. Almost three months ago I began working on a story about a homeless man I encountered while on assignment covering the Pasadena City Golf Championship. I was intrigued that several golfers who are regulars at Brookside Golf Club knew Lawrence Hunter well. It took a few days to gain his trust, but when I did, Hunter opened up and allowed me to spend time with him. We lunched at Brookside and hung out at his regular spots, like the cement channel at Brookside and an offramp near the Rose Bowl. A version of this article appeared in print on Saturday, July 24, 2010, on page A1 of the Star-News. PASADENA — Lawrence Hunter is embraced with a warm hug from a waitress at the Brookside Golf Club restaurant, where he goes each morning for coffee. She’s happy to see him break his routine of only sipping coffee. On this occasion, Hunter accepts a lunch invitation and orders a bacon-cheeseburger and fries. Hunter, 51, is no stranger to Brookside – he’s been coming for more than a decade – but he has never shot a round of golf there in his life. Instead, he spends his days and nights living in cement channel alongside holes No. 7 and 8, two greens featuring neatly-manicured Poanna grass with a backdrop of the picturesque San Gabriel Mountains. Hunter patiently waits for errant golf balls flowing down the Arroyo Seco. A green fish net tied to the end of a long aluminum pole makes it easy to catch the balls. Hunter has learned over the years how to spot a quality ball from a bad one from afar. He collects them and separates them into zip-lock bags. When he has enough, he sells them back to golfers. Hunter would not say how much he earns, but says it’s enough for food for him and his dog, Nuclear, a year-old pit with a powdery white coat. The cops have been called — a few times, said David Sams, who heads up golf course operations for the Rose Bowl. But in eight years, police have come out only “three or four times” in response to complaints about Hunter, Sams said. Mostly, course officials have come to accept Hunter as a sort of pseudo-resident. “It comes to the point where bygones are bygones,” Sams said. Ask people who know him and they’ll say that something about Hunter doesn’t add up. They use words like “bright,” “friendly” and “kind” when describing him. They can’t understand how he came to live isolated in a flood control channel — and why he’s still there. Star-Jibber: Who is No. 1 in preseason top 10 poll? 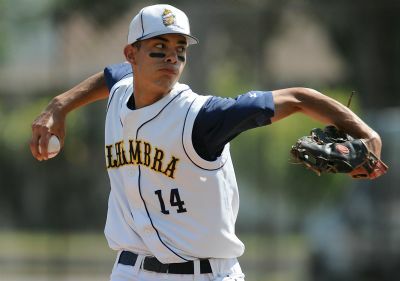 USA Baseball announced the 22 members of its 2010 Collegiate National Team, and among them is Alhambra grad Noe Ramirez (Cal State Fullerton). Our congrats to the former Moor! Football: When is it too early for All-Area nominations?